California's only coastal island retreat is a short trip away from Los Angeles and part of the same county, but it's surprisingly different from its mainland counterpart. Most of its land is preserved as a nature conservancy, surrounding the small town of Avalon where about 3,000 people live. Avalon is a small, walkable town centered on the small boat harbor and waterfront, with enough hotels, restaurants, and activities to keep visitors happy. 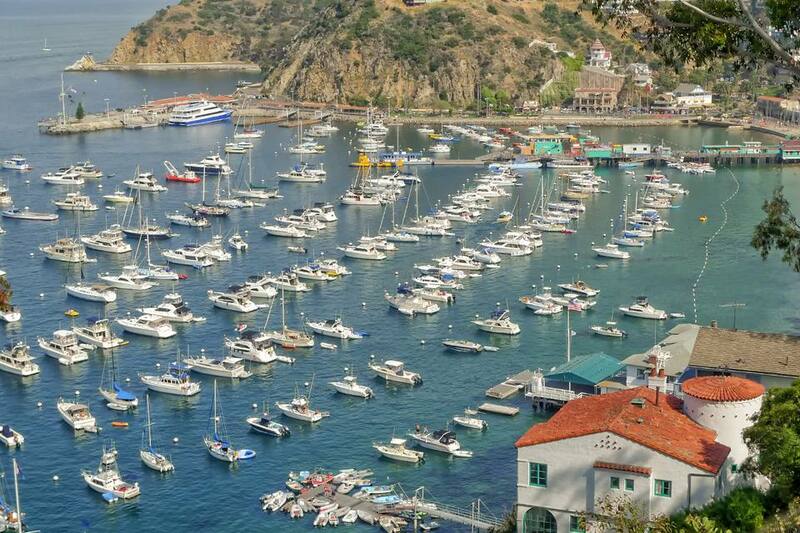 You can plan your Catalina day trip or weekend getaway using the resources below. Enjoy some of our best shots in this Catalina Island Photo Tour. Why Should You Go? Will You Like Catalina Island? Catalina is a cute place that's popular with scuba divers, hikers, families, and anyone who needs to get away from the city or wants to take a romantic escape. Catalina weather is best in spring and fall. Summer days can be overcast until noon or later. In winter, storms can make the ferry ride unbearably choppy. It's busiest during summer and big events like the marathon and jazz festival. See the list below. Cruise ships stop in Catalina several days a week, temporarily filling the town with visitors. If you want to avoid them, check the cruise ship schedule. If you've only got a day, your best bet is to hang around town in Avalon. Take a short city tour if you want to learn more about the place. Walk along the waterfront. Sit and watch the people or do a little shopping. If you want the short list, try the best things to do in Catalina. If that's not enough, browse through 101 Things to Do in Catalina. Catalina Marathon, March: Even if you're not running, you should know about it because the hotels fill up. If you're looking for everything that might be going on while you're there, check the Chamber of Commerce calendar. Plan ahead. Hotels fill up early during busy times, and so do the most convenient ferry runs. You can take your pets on the Catalina ferry boats, but dogs must have a muzzle. However, pet-friendly lodging is in short supply, and canine friends are not allowed on the waterfront walk between Metropole and Clarissa Avenues. It costs a lot to get things to the island. Expect to pay 15% to 20% more for everything than you do on the mainland. If you have an option, schedule tours in the late morning or afternoon. You'll have the best chance of clear skies then. If you have humidity-sensitive, frizzy hair like mine, bring your strongest defenses. Or a hat. Or a razor in case things get really bad. The most romantic thing to do? Just walk along the waterfront, hand-in-hand. We like the Bluewater Grill's patio for a sun-drenched lunch. For other meals, Avalon is small, making it easy just to walk around and pick something that looks good. Our rule of thumb: The more people inside, the better. Check our recommended hotels and campgrounds. Catalina is not a place to arrive in without a reserved place to stay. Not only do the hotels get filled up, but if you arrive without a reservation and can't find a place, you might not be able to find room on the boat back to the mainland, either. Avalon Trolley: Runs from Pebbly Beach or Descanso Beach to the Botanical Garden, daily in summer, weekends and cruise ship days the rest of the year. Golf Cart Rentals: Rent by the hour, near the ferry terminal and in town. Airport Shuttle: Avalon to Airport-in-the-Sky, phone 310-510-0143. Catalina is 26 miles from Los Angeles. Check out Catalina ferry rides and other ways to get there.